This massive boulder pile/rock slide is on the same slabby, rocky hillside as The Tank. Follow the same approach as The Tank and hike down into the rock pile and choose a boulder and go at it! The Goldbug Boulder is in about the top/center of the pile. Goldbugs Traverse V3 Traverse horizontal crack from right to left. V? 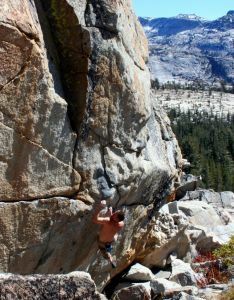 Highball face climbs – left, right or center of Goldbug Boulder? Which SuperTopo guidebooks cover May Lake - Rock Slide?